Matt’s relationship with comics started in 1974, back when he would hunt them down in convenience stores. He became so immersed in the fantastical worlds on the comic page that he even wrote in a few fan letters and had them published! He came to Boston in 1981 for school, and that was when he learned of the existence of stores dedicated solely to selling comics. Graduating in 1985 with a Bachelor’s degree in math, Matt worked for another store for a few years and then opened Comicopia with a business partner in 1989. He was a judge for the 2002 Eisner Awards. Even though he’s running around teaching and learning math a whole lot these days, he can still be found in the store from time to time, trying to convince folks to buy Math Girls. Dan started out reading Tin-Tin comics at a young age and soon after became a fan of the Spider-Man animated series of both the 80’s and 90’s. Comics wouldn’t be a big part of his life until after high school when he was introduced to Ultimate Spider-Man, Demo, The Nightly News, and Runaways. Dan is also a pro wrestling aficionado, Funko Pop collector extraordinaire, and streamer with Bored & Hungry Guys at Twitch.TV/BoredAndHungryGuys. Your local transmasc reader and writer, Robin is trying to take over the world, one queer narrative at a time. He’s had a YA novel and short story published traditionally, but it was under his dead name, and he is a better writer now anyway so he doesn’t dwell on that too much. 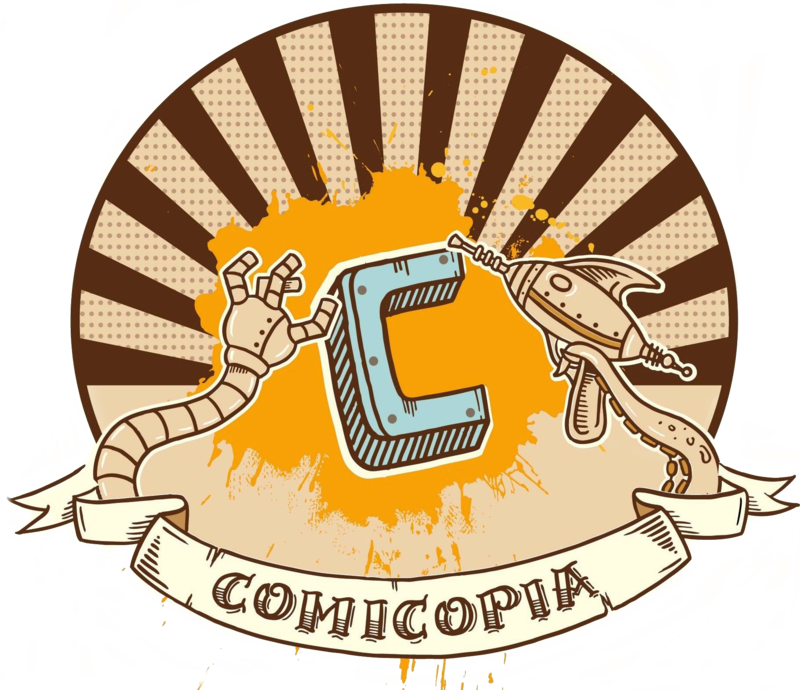 After a two year stint as a barista, he remembered his love of book selling and came to Comicopia to try to wean himself off his coffee addiction (still working on that) and immerse himself back in the world of storytelling. He is always looking for recommendations for happy queer and trans stories. Part Golden Retriever, Part Stuffed Animal, Part Cryptid, All Good. We’re having a hard time getting her into comics (it’s hard to hold them open without thumbs), but she is excellent with customers! As a full-time professional Good Dog, Deli is only available to work at Comicopia on Mondays, so keep your eye out for her then! We have treats here for you to give to her, if you were concerned about that first step.